This system always holds five ETFs (equity-, fixed income-, short equity-, and Gold-ETFs) selected according to stock market climate and rank. Typically, during good-equity markets it holds equity-ETFs, and during bad-markets fixed income-ETFs and/or short equity-ETFs. Also at times it can hold three gold-ETFs with other ETFs. A one factor ranking system selects five ETFs from a preselected list of 29 ETFs. 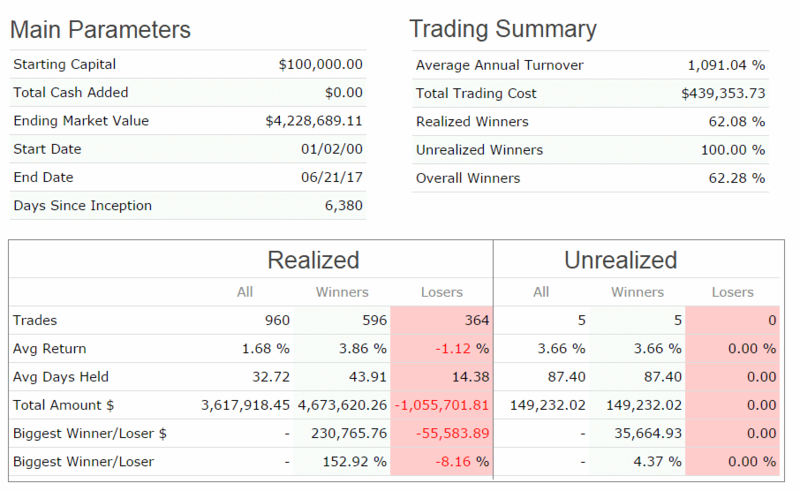 A simulation from 2000 to 2017 shows a 24% annualized return with a maximum drawdown of -12%. This model, unlike the iM-5 ETF Trader, does not trade in leveraged-long and leveraged short ETFs. The model was backtested on the on-line simulation platform Portfolio 123 which also provides extended price data for ETFs prior to their inception dates calculated from their proxies. ETFs, other than P123 extended ETFs, were only considered for selection six months after their inception. Trading costs, including slippage, were assumed as 0.1% of the trade amounts using closing prices. The basic approach is to invest in five equity-ETFs during up-market periods and in five fixed-income-ETFs during down-market periods. Market timing rules, listed further down, were applied to identify those periods. Further improvement to annualized return is achieved by adding an inverse equity-ETF during down -markets. buy Equity-ETFs when up-market conditions exist. Performance from Jan-2000 to Jun-2017 is shown in Figure-1. The model showed an annualized return 23.9% with a -12.1% maximum drawdown. The simulated performance from Mar-9-2009 to Jun-2017 is shown in Figure-2. The start date for this period is the date when the S&P 500 was at its lowest level during the financial crisis recession. For the approximately 8-year backtest period the simulated annualized return was 25.4% with a maximum drawdown of -9.1%. The model significantly out-performed with lower drawdown the SPDR S&P 500 ETF (SPY) over this up-market period. Rolling 1-year returns with a 1 week offset are shown in Figure-3. There were 2 sample periods out of 860 showing a small negative 1-year return of about -0.3% to 0.0%, with transaction costs included. Calendar year returns are shown in Figure-4. There was never a year when the model had a negative return, but under-performed SPY over 2012. This is a trading model with an average annual turnover of about 1,090% (11 x). The average holding period of a position was 33 days, 62% of all trades were winners, and the biggest trade loss was -8.2%, all as shown in the table below. This model could be of interest to investors willing to accept a fair amount of trading activity. Note, that this is a trading model with 82% of all trades having a holding period of three weeks or less. There were 56 trades per year on average, and the maximum was 131 trades in 2015. Nice……Any guess why the trailing 3 year annualized performance (13.8%) is 42% less than the annualized performance from 2000 (23.9%) ?? During upmarket periods (such as the last 3 years) model can only moderately outperform buy-and-hold SPY because it does not hold long leveraged ETFs. We can only get correlation numbers for individual models not combos. 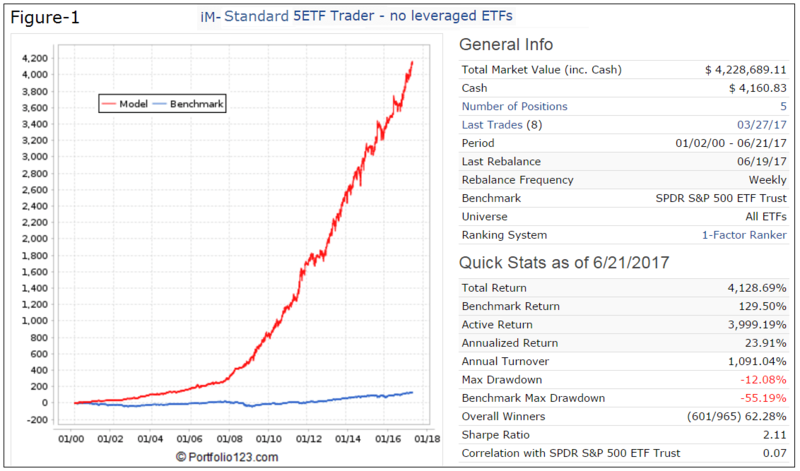 I’m thinking of using the leveraged 5 ETF Trader with either the Standard 5-ETF Trader or the Minimum Drawdown Combo. 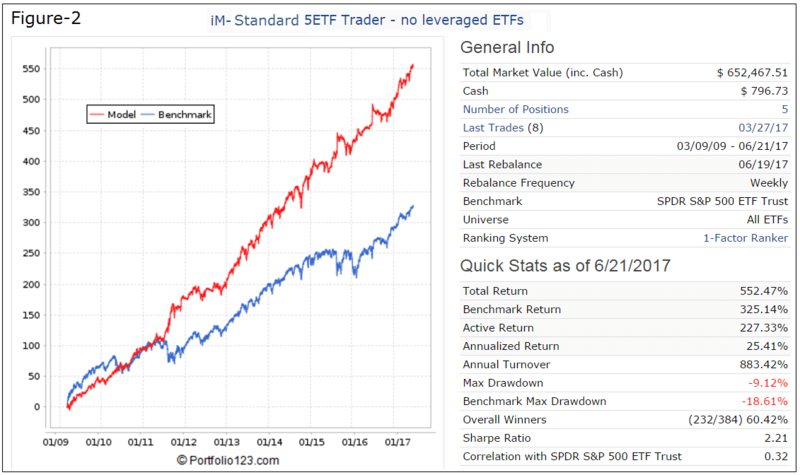 Performance for a 50% Standard 5-ETF Trader with 50% 5-ETF Trader (leveraged) would be performance for 1.5xleveraged (Standard 5-ETF Trader). The correlation between the two models is a high 94%, which does not provide any smoothing of the performance curve. You mention that nearly 82% of all trades are held 7-21 days — yet the current holdings were purchased back on 03/27/2017 (nearly 1 1/2 years ago) — curious about this .. maybe you can give explanation. Thanks. The long holding period is due to the fact that we had upmarket conditions for such a long time. Note that 1.7% of trades were held longer than one year. How can this model be buying SPY if down market conditions exist? In this instance the SPY cancels the SH, and therefore the model should hold 40% cash instead of those two ETFs.